WSDOT uses the Superpave mix design method (also commonly called the Gyratory mix design method. Like the Hveem and Marshall methods, the Superpave method has been proven to produce quality HMA from which long-lasting pavements can be constructed. This section briefly discusses the Superpave mix design method. 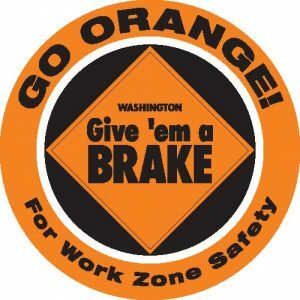 WSDOT uses the Superpave mix design methods. 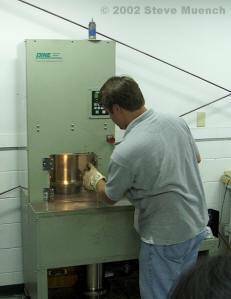 Some agencies and private laboratories may use the Marshall method. Each method has been proven to produce quality HMA from which long-lasting pavements can be constructed. Aggregate selection. Aggregate is specified in three ways. First, restrictions on aggregate gradation are specified by using gradation specifications. Second, there are requirements on aggregate angularity, flat and elongated particles, and clay content. Third, aggregate criteria, which the Asphalt Institute (2001) calls “source properties” (because they are considered to be source specific), such as durability and soundness are specified. Asphalt binder selection. 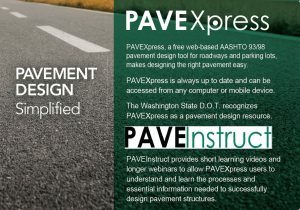 WSDOT uses the Superpave PG system for asphalt binder specification. Superpave PG asphalt binders are selected based on the expected pavement temperature extremes in the area of their intended use. These extremes can be calculated using software (such as LTPPBind) or, more commonly, determined based on standard PG binders that WSDOT has specified for each area of the State. Sometimes, these standard binder grades can be adjusted based on the anticipated traffic level, type or speed. 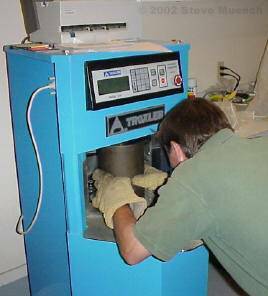 Prepare 6 initial samples, two at the proposed design asphalt content, two at 0.5 percent below the design asphalt content and two at 0.5 percent above the design asphalt content. Compact these trial mixes in the Superpave Gyratory Compactor (Figures 1, 2 and 3). This compactor is specific to the Superpave mix design method. Select the optimum asphalt binder content. The asphalt binder content corresponding to 4 percent air voids. 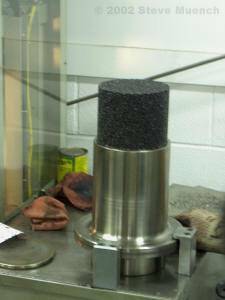 The Asphalt Mixture Performance Tester (AMPT) is used in the Superpave mix design process to test performance.